AT/AF Episode Detection is a Medtronic Insertable Cardiac Monitor (ICM) feature that detects regular and irregular atrial arrhythmias. Patients experiencing palpitations and rapid heartbeats associated with atrial arrhythmias. Monitoring for the recurrence of atrial arrhythmias in patients who are post atrial ablation. Monitoring AT/AF burden and the occurrence of asymptomatic episodes of AT/AF, to assess whether medical treatment is necessary or should be adjusted. 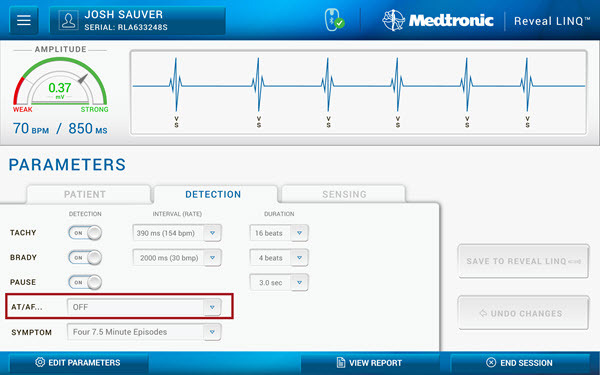 This feature can be found in some Medtronic insertable cardiac monitor (ICM) devices. Please go to manuals.medtronic.com or consult with your local Medtronic representative regarding device models available in your geography. If you select AF Only, the following programming screen appears. Default settings are shown. If you select AT/AF, the follow programming screen appears. 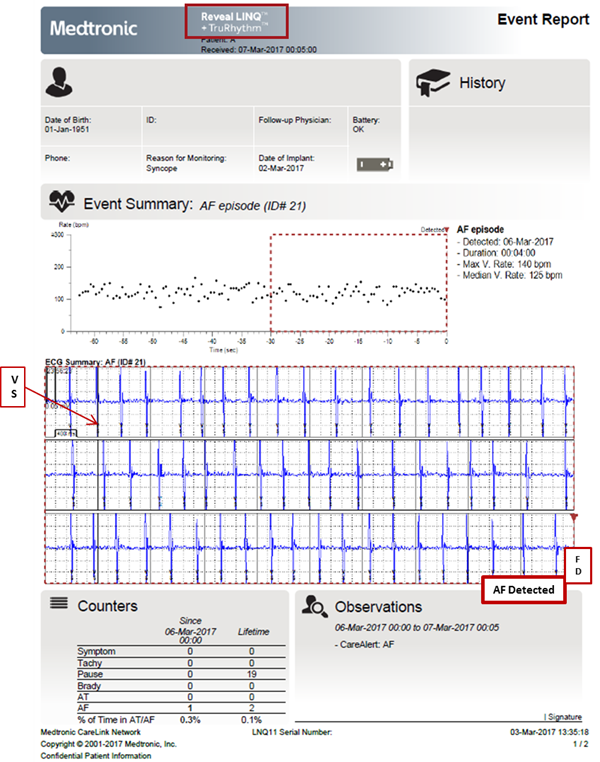 AT/AF Episode Detection identifies the occurrence of AT/AF episodes from variations in the ventricular rhythm. AT/AF episodes are detected using an automatic algorithm based on the pattern of R-wave interval variability within 2-minute periods. The differences between consecutive R-wave intervals are plotted in a Lorenz plot (scatter plot) in order to reveal patterns in the rhythm. Pattern recognition, derived from the Lorenz plot is then used to identify AT and AF episodes. R-wave intervals during AF episodes are highly irregular and uncorrelated, whereas more regular R-wave patterns are expected during AT episodes and sinus rhythm. A clinical AT rhythm with some irregularity may be classified as AF. The difference between 2 consecutive R-wave intervals (ΔRRn) is plotted on the vertical axis in the Lorenz plot. The preceding R-wave interval difference (ΔRRn-1) is plotted on the horizontal axis. Below are some examples of Lorenz plots showing the different patterns used to identify AT and AF episodes. Note the pattern of scattered dots shown in the AF episode Lorenz plot illustrating irregular R-R intervals. The pattern of more regular R-R intervals displayed on the normal sinus rhythm Lorenz plot shows a pattern with the dots close together instead of scattered. 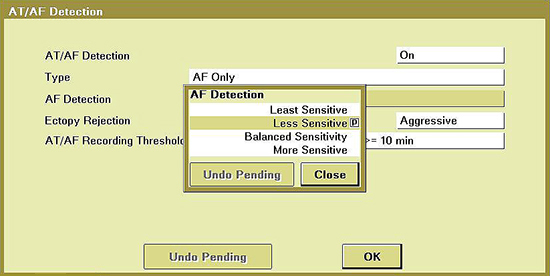 AF detection settings are auto-adjusted based on the Reason for Monitoring, which is found in Device Data Collection. The nominal settings for AF Only detection ensure optimal performance of AF detection in most patients. In some instances, the parameter may be reprogrammed to suit individual patients. The Sensitivity setting is not related to sensing of R-waves, but rather the sensitivity of R-R irregularity, or the threshold to declare AF. If in the 2 minutes of analysis, the Lorenz plot calculations conclude greater irregularity than the programmed sensitivity, AF is declared for those 2 minutes. For example, if sensitivity is programmed to Least Sensitive, then the AF threshold is at the highest level, which means that AF is detected when the ventricular rhythm has more irregularity. An example of the AF calculation based upon the sensitivity setting is shown in the figure below. A primary cause of false positive AF detection is a run of ectopy (PACs or PVCs) with irregular coupling of intervals caused by underlying sinus variability. Two rejection algorithms exist to prevent false detections. The Ectopy Rejection algorithm recognizes patterns of ectopy by the density of points in the Lorenz Plot. The P-wave presence algorithm looks for evidence of a P-wave between two R-waves. When Ectopy Rejection is set to "Nominal" the P-wave presence algorithm is enabled. When Ectopy Rejection is set to "Aggressive", both the P-wave presence and the Ectopy Rejection algorithms are enabled. The device will not detect AF when the algorithm detects evidence of ectopy during any 2 min period. When Ectopy Rejection is set to "Off", both the P-wave presence and the Ectopy Rejection algorithms are disabled. 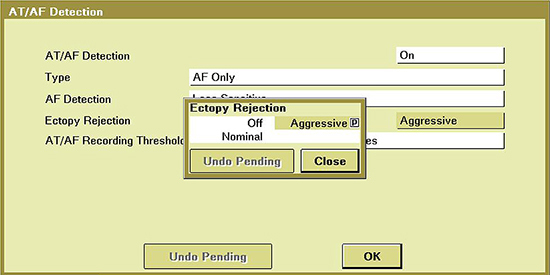 Examples of AF calculations are given in the figures below for Ectopy Rejection set to "Nominal" and "Aggressive" modes. the patient’s heart rate is greater than 77 bpm and the T-waves may overlap with the P wave window. In Reveal LINQ™ ICMs with TruRhythm™ Detection, a self-learning algorithm has been added to enhance the AT/AF Episode Detection feature. 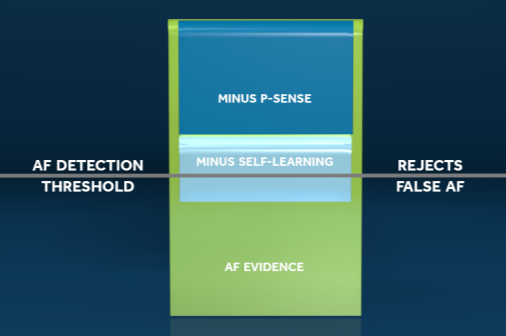 The TruRhythm self-learning algorithm keeps a history of P-wave evidence and uses this history to adapt the level of AF evidence needed to detect an AF episode, thereby reducing the number of false positive AF episode detected in patients with Sick Sinus Rhythm or PACs. As mentioned earlier, AF evidence analyzes R-R variability over 2 minute periods. P-sense uses the same 2 minute interval to monitor for adequately sensed P-waves and builds evidence of the presence of P-waves. The AF evidence must be above the programmed threshold to be considered AF. When there is a high degree of R-R variability, yet sufficient evidence of P-waves, TruRhythm detection will correctly reject these episodes as AF. When high evidence of P-waves is found, the Modified AF Evidence is used for the rest of the day. It does not start over for the next 2 minute period. The self-learning algorithm allows the device to remember and adapt the P-wave evidence throughout the day. Reveal LINQ™ ICMs with TruRhythm Detection may be identified by the serial number. In addition, you will see “Reveal LINQ™ + TruRhythm™” on the pdf heading of all CareLink™ Reports. Consult with your local Medtronic Representative on the changes specific to your geography. The AF algorithm tracks R-wave variability and collects the P-wave evidence history. This P-wave evidence is used to adapt the AF detection threshold. This adaptation was designed to improve the rejection of false AF episodes. If you select AT/AF as the detection Type, the following programming screen appears. Nominal settings are displayed. Note: Program AT/AF Detection to "Off" to prevent automatic detection of AT/AF episodes. 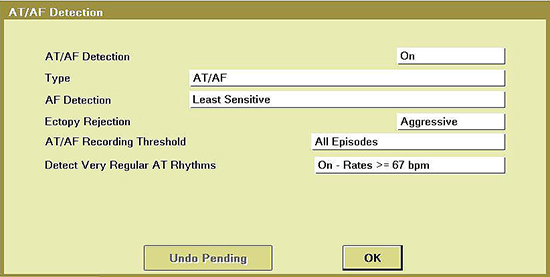 If the heart rate during an AT episode is less than the programmed "Detect Very Regular AT Rhythms" parameter setting, the AT Episode is not detected. If the "Detect Very Regular AT Rhythms" parameter setting is set to "On – All Rates", the system detects all AT episodes. If the "Detect Very Regular AT Rhythms" parameter setting is set to "Off", very regularly conducted atrial tachycardias such as consistent 2:1 or 3:1 atrial flutter will not be detected. Note: An AT/AF episode can occur simultaneously with one of the other types of episodes. If this occurs and detection is programmed On, the Reveal LINQ device will store information and an ECG recording for both types of episodes. Arrhythmia episode data is stored in an episode log. This includes up to 30 episodes each for AT, and AF. For each AT/AF episode the device stores an ECG of the first 2 min of the episode. The AT/AF Recording Threshold allows for recording to be enabled based upon episode length. If AT/AF Recording Threshold is programmed to Only Longest Episode, an AT/AF episode of 10 min or greater duration is required to store an episode log and ECG. Until the device is interrogated, each subsequent AT/AF episode that is of greater duration overwrites the previously recorded shorter episode. AF detection is programmed "On". 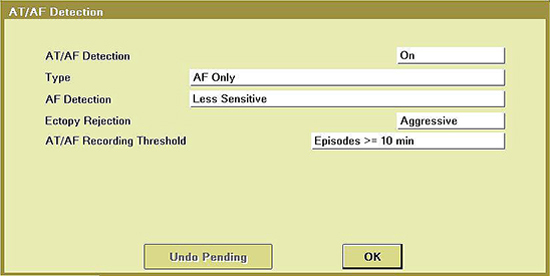 The CareAlert for an AF episode is enabled in CareLink. The AF episode is the longest event of the day, per the Wireless event details. No other episode types are detected during that same day. The AF event details will be sent to the CareLink network in the daily wireless audit by the MyCareLink monitor. As a result, a CareAlert notification (based on clinic defined methods) will be generated and the AF episode will be displayed in the Event Report. 10 seconds of the longest AF episode shown at the bottom of the report. It is important to note that a 10 second ECG strip of the Longest AF episode will appear at the bottom of the Event Report for both Reveal LINQ and Reveal LINQ with TruRhythm. The clinician is notified of the CareAlert notification based on clinic defined methods. The examples below illustrate an event report that was generated by an AF CareAlert notification. In both examples, the interval plot clearly depicts the variability in the R-R intervals that led to AF episode detection. The episode details are also displayed. The first example is page 1 of a Reveal LINQ ICM with TruRhythm Episode report. Notice that “Reveal LINQ™ + TruRhythm™” is displayed at the top of the reprt and the length of the ECG strip is 30 seconds. 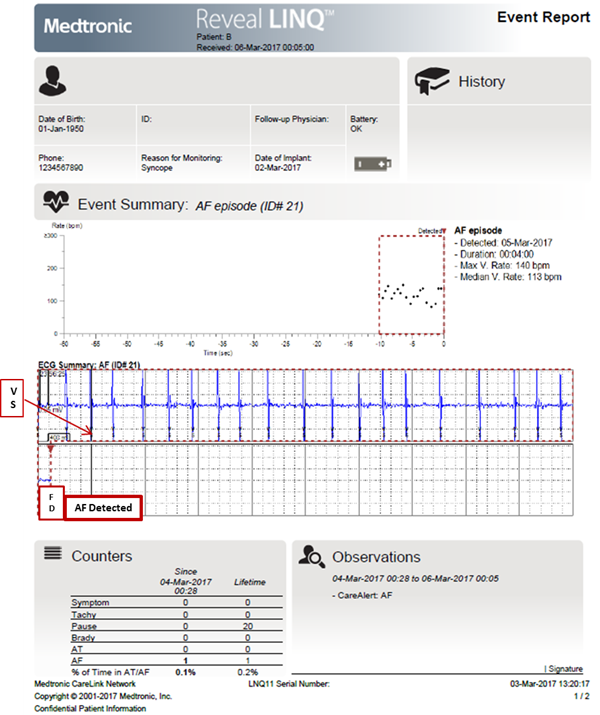 The second example is page 1 of a Reveal LINQ Event Report and the ECG strip is 10 seconds in length. In both examples, VS corresponds with each QRS complex and AF Detection is observed on the ECG. Sources: Medtronic REVEAL LINQ™ LNQ11 Clinician Manual, Reveal XT 9529 Clinician Manual, TruRhythm™ Detection Algorithms. Medtronic data on file. 2017.